View across the Caledonian Canal to Ben Nevis and Fort William, Corpach, Scotland. Fort William is a town at the head of Loch Linnhe. A fort was built here by General Monck, then rebuilt in 1690 and named Fort William. Today the town is a tourist cntre, overlooked by Ben Nevis, Britain’s highest mountain. It lies at the start of both the Caledonian Canal and the ‘road to the isles’, which runs past Glenfinnan to Mallaig. 20 Walks Around Glen Nevis and Fort William, Scotland. Central Highlands (Pocket Mountains) This guide features 40 circular routes in the inspiring mountain heartland of the Central Highlands. With the brooding mountains of Glencoe, the long ridges over Glen Nevis and the rolling plateau of the Monadh Liath, this popular region has something for everyone. The routes in this volume take in all of the Munros and many other fine hills. Mountains of Loch Etive, Glencoe and Loch Leven, Glen Nevis and Glen Spean, Laggan and Corrour, Dalwhinnie to Kingussie. The Highland High Way: A High-level Walking Route from Loch Lomond to Fort William The Highland High Way is a high level route running for 105 miles from Loch Lomond to Fort William. This book describes an eight-day route, taking in about 23 mountains. It contains route descriptions, sketch maps, mountain safety information, and historical and geographical highlights. The Caledonian Canal Thomas Telford's plan, to connect Loch Ness, Loch Oich and Loch Lochy with each other and the sea, was a huge undertaking which brought civil engineering to the Highlands on a heroic scale. Deep in the Highlands, far from the canal network of England, engineers forged their way through the Great Glen to construct the biggest canal of its day: twenty-two miles of artificial cutting and no fewer than twenty-eight locks. A.D. This book has long been recognised as the authoritative work on the canal as well as a reliable and useful guide to the surrounding area. There are intriguing old plans, not discovered until 1992, and a survey of the dramatic rise in pleasure-craft traffic during the last two decades. But the highlight of the recent past was undoubtedly the Tall Ships passing through the canal in stately procession in 1991. Impossible, then, not to feel the fascination of this beautiful waterway: a working piece of industrial history and a remarkable engineering achievement. This book is a fitting celebration of this remarkable feat of engineering. 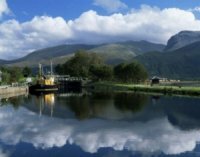 The Great Glen Way: A Low-level Walking Route from Fort William to Inverness This is a guide to the Great Glen Way in Scotland, a 70-mile trail which takes a route from Fort William at the foot of Ben Nevis all the way to Inverness. The walk follows in the footsteps of Bonnie Prince Charlie and takes the walker through the sites of great battles. The North West Highlands: Roads to the Isles, the Obvious Beauty and Hidden Delights of the Mountainous Lands from Fort William to Ullapool (Luath Guides to Scotland S.) This title deals with the vast and lovely area lying to the north and west of Fort William, and going up through the Highlands as far as Ullapool. It is a land of still unspoiled loveliness, of mountain, loch and silver sand. It is a quiet land of peace and grandeur. Legend, history and vivid description by an author who loves the area and knows it intimately make this book valuable to all who visit this Highland wonderland.